Longhi was a Venetian portrait painter and printmaker in etchings that were mostly reproductions of paintings. He is best known best for his oil portraits of Venetian nobles of state. His father was the famed genre painter Pietro Longhi (1701 – 1785). He trained under his father and Giuseppe Nogari (1609-1763), the Venetian Rococo painters. Like Sebastiano Bombelli (1635 – 1719) in the prior century, Longhi is noted for his zealous full-length depictions of robes and emblems of office. 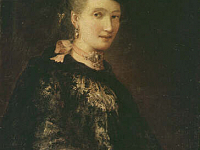 His work in the Uffizi Gallery, Portrait of a Lady, shows intricate attention to detail in the dress and decorative accessories of the sitter. Longhi’s etching style also showed a strong influence from Rembrandt’s work in etching (1606 – 1669).